Fiction – Kindle edition; Wakefield Press; 260 pages; 2015. Every now and then I pick up a book and within a matter of pages — or perhaps sentences — I know this is exactly the right kind of book for me. That’s how I felt when I started reading Stephen Orr’s The Hands: An Australian Pastoral, which was longlisted for the 2016 Miles Franklin Literary Award. The mood of the story, coupled with the great characters and economical prose style, hooked me from the start and I read it in one (very long) sitting. I rather suspect that come 31 December, it will prove to be my favourite book of the year. Bundeena was marginal country. It could carry cattle, sparsely. To Trevor, this was where Australia became desert, where man—following the east-west railway, before it seriously set its sights on the Nullarbor—had given up on agriculture. Most men, at least. Except for them: sixth-generation Beef Shorthorn producers who’d wrestled with the land for 130 years. This was country that hadn’t asked for farmers but had got them anyway. On the southern edge, the railway line, and to the north, nothing. They had neighbours to the east and west, but they might as well have been living in New Zealand. The word was with Murray and Murray was the word. Not for the first time, he [Harry] could feel himself starting to hate his grandfather. There wasn’t much love or compassion in him. He was a sort of farmer shell, a hollow man full of regrets and knowledge and skills he couldn’t use any more, except as a sort of walking opinion that no one wanted to hear. The story follows the Wilkie family over the course of a few years, during which everything seems to go wrong. There is tension — and later tragedy — at every turn, particularly between both sets of fathers and sons. Aiden, for instance, doesn’t see the point in continuing his education and wants to begin farming with his dad, but Trevor keeps insisting he must finish his final year or he will regret it later. Meanwhile, Murray, angry, embittered and haunted by the ghosts of the past, won’t relinquish control of the farm, even though Trevor’s been running it almost single-handedly for years. These familial disputes are played out against a backdrop of ongoing drought (six years and counting), of ever-diminishing returns and ever-increasing debt, which makes the pressure on the Wilkie’s, in particular Trevor, almost unbearable. There is a very real sense of despair just hovering in the peripheral vision of most of these characters; they know it’s there but refuse to see it. Instead, they blindly plough on, distracting themselves with the routine of running a farm and trying not to think too much about the future. And yet, with every farming family, the future is paramount, for it is the children of farmers who are expected to carry on the business and, unusually, in this case, there is one father (Murray) who is reluctant to pass his legacy on and one son (Aiden) who is desperate to do what so many of his generation do not want to do — to make a living on the land. And there’s also concern about what to do with Chris if anything happens to Fay, who is now in her 70s: should the family continue to look after him or put him in a nursing home? Yet despite the drama that propels the narrative forward, this is not a heavy book. Orr writes with a skilful lightness of touch, punctuating his quietly subdued prose with understated humour and restrained emotion. The characterisation in this book is its real strength — the story is told from multiple, mainly male, perspectives across three generations, and each strong, distinctive voice, whether it be an 11-year-old’s, a teenage boy’s, a middle-aged farmer’s or an angry, bitter grandfather’s, seems palpably real and authentic. You get a real sense for each individual — and you are either charmed or irritated by them. Even Chris, a “forty-six-year-old man-boy”, is given enough quirky detail — a flair for taking off his clothes, a penchant for watching old war movies, a willingness to use the garden shears — to give the reader a vivid portrait of someone who could so easily have been drawn as mere caricature. But, of course, it’s how the characters develop, change and grow over this rather turbulent few years that gives the book its momentum and its compelling, page-turning quality. There was something about this book — the all-encompassing portrait of one family living in rural isolation — that transfixed me from start to finish, almost as if I had accompanied them on this emotional journey, perhaps sitting in the farm truck as it made its rounds fixing fences or checking on cattle. I love it when you get so involved with the characters you forget you are actually reading a book. For other takes on this novel, please see Lisa’s review at ANZ LitLovers and Sue’s at Whispering Gums. Update 31 October: French blogger Emma, from Book Around the Corner, has also reviewed it. 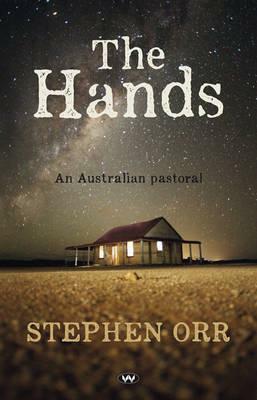 The Hands: An Australian Pastoral has only been published in Australia, but UK readers can buy the (pricey) paperback edition, via the Book Depository, or the Kindle edition, via Amazon, for less than a fiver. US and Canadian readers can only buy the Kindle edition, via Amazon. This is my 44th book for #ReadingAustralia2016. What perfect timing! This Thursday I am to have the very great pleasure of meeting Stephen Orr who is over from SA for the launch of the Griffith Review Novella Edition, and I will be able to pass on the news of this review to him, in person:) Wakefield is a small indie publisher from Adelaide, so they will be delighted as well. I think he’s one of our finest writers. Oh, that’s exciting, Lisa! I honestly loved this book. I’m keen to read more, but the cost is a bit prohibitive — most of the Kindle editions are more than £10. I see one of his earlier novels, Hill of Grace, is £6 on Kindle so I will definitely buy that. Have you read that one? Yes, I have, and it’s terrific. All the ones I’ve reviewed are here: https://anzlitlovers.com/category/writers-aust-nz-in-capitals/orr-stephen/ (But The Hands is my favourite). I read this after Lisa’s recommendation. I loved it and your review gives a good idea of the novel. Oh, I must look at your review. I would have said that as an Australian I understood the sense of space and isolation depicted in this book but it wasn’t until I went on my first proper foray into the outback last year that I really comprehended it. We drive 10 hours one day, on a dead straight road, and saw just two other vehicles. The distances / space is just massive. It gave me a good feel for the kind of isolation the cattle station in this book faced. Thanks for the link, Kimbofo. I can’t add to your review because you’ve got it down perfectly… The setting, the characters and that spot on language. I tried to get my reading group to read it this year. Think I might try again next year. I know they’ll love it. Oh, it’d be a great book to discuss… so many things to talk about: the future of farming, drought/climate change, mental health, importance of art/creativity, what it is to live an isolated life and the implications on health, education and socialising, and then all the stuff about human behaviour (love, death, grief, bullying) and the role of women on the land. I’m actually tempted to choose it for my book group at some point! What a great review… I get a real sense of an almost oxymoron effect of claustrophobia despite the expansive, open setting of the outback that feels very much like an additional character. As I’m looking at characterisation this week for my WIP it’s a timely reminder of the importance of distinct characters not morphing into caricatures and each achieving some growth, journey. Is there much perspective seen from Carelyn or/and Faye? We don’t get much of a woman’s perspective but there’s a reason for that (which I can’t reveal without ruining the plot). After reading this book (after readinf Lisa’s review) I promptly went to Wakefield Press’ site and bought 3 of Orr’s books (they had a special 3 pack on sale). I’ve since read Hill of Grace which starts slowly but is well worth reading. I have Hill of Grace, which I bought on Kindle, after I read this. I hope to get to it sooner, rather than later. Well, you’ve got me with your Kent Haruf comparison, Kim. I’m going to get my hands on a copy of this, one way or another. Well, I hope I haven’t oversold the Haruf comparison… Orr is, after all, his own man… But I did see similarities in tone, style and subject. Added to Christmas list! Thanks! Hope you receive a copy and enjoy it!